There is nothing quite like having a nice hot cuppa of your favorite joe in the morning to spruce things up. After all, the work day isn’t going to get any easier as it progresses (that’s the norm, no? ), right? You could always receive help from the kitchen or pantry using one of those machines that churn out coffee by the cup, but if you use your hands via the Hand Powered Espresso Maker, it will be done with love and passion – and surely that would translate to a better taste for most folks. This hand-powered espresso maker is touted to produce rich Italian coffee drinks sans electricity, letting you stay up through the day in the office even when there is no power supply. All you need to do is pour hot water into the top of the unit, push down both levers to drive a piston downward, where that will create up to 10 bar of pressure to extract rich, complex espresso topped with crema. With a portafilter that holds one or two shots of ground coffee alongside its removable dual spout which can pour a couple of drinks simultaneously, you will more or less get the perfect cuppa all the time. 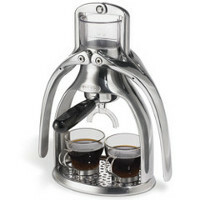 $149.95 for a hand cranked espresso maker? Smells good to us. If there isn’t any power, where did the hot water come from to pour into the unit? You have to supply the hot water.